A futuristic 'plasma jet' that eradicates tooth decay without fillings could be replacing the hated dentist's drill in as little as three years, it was claimed today. The space-age device fires a beam of electrically-charged oxygen atoms into tooth cavities to obliterate decay-causing bacteria. Traditionally, the same job is done by drilling holes into the tooth that has to be filled. Unlike the dentist's drill, the plasma jet is non-invasive and pain-free. 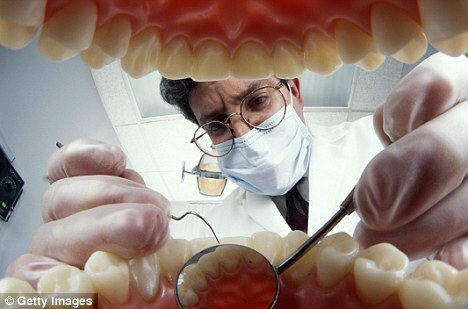 Fear of fillings is a genuine phobia for some people, causing them to avoid visits to the dentist. A new study has shown that firing low-temperature plasma beams at dentine - the fibrous tooth structure below the enamel - can reduce bacteria levels by up to 10,000 times. Researchers in Germany tested the effectiveness of the plasma jet against common dental bugs including Streptococcus mutans and Lactobacillus casei. Both form films on the surface of teeth and are responsible for the erosion of tooth enamel and dentine that causes cavities. The scientists infected dentine from extracted human molars with four strains of bacteria and exposed it to plasma for between six and 18 seconds. The longer the treatment continued, the greater the amount of bacteria that was eliminated. Plasmas are produced when atoms in a gas are stripped of one or more of their electrons, leaving them positively charged. Normally plasmas are formed at very high temperatures, but those tested by the German scientists were 'cold' plasmas no hotter than around 40C. He added: 'Drilling is a very uncomfortable and sometimes painful experience. Cold plasma, in contrast, is a completely contact-free method that is highly effective.